Sensory play has an important role in development. When you talk about the senses, most kids over a certain age can rattle them off without problem: sight, smell, hearing, touch, and taste. Any and all of these can be incorporated into sensory play. It's not just children who have difficulty with sensory integration who can benefit from sensory play; it's all children. There are certain groups of children, such as those who have autism or those who have sensory integration dysfunction disorder who have specific difficulty making sense of and organizing all the stimuli that come at them via their senses. The truth is, all children need help learning how to use their senses. From the very first day they are born, children are designed to explore the world via their senses. That's why babies and toddlers touch everything and put things in their mouths, and why kids make funny noises with their mouths and experiment with how the world sounds with their fingers stuck in their ears. It's why your child spins in circles until they're so dizzy, they fall, then get up and do it again. Some people, when they think of sensory play, immediately picture sand and water tables or kids playing with clay and playdough, but it isn't all about touch; it's also about the other senses. For instance, the sharp scent of vinegar involved in a science experiment, the colors of water during a color mixing experiment, or the texture and smells of scratch and sniff painting are all part of appealing to your child's senses. Sensory exploration is a child's way of examining, discovering, categorizing, and making sense of the world, and it's beneficial to provide them with opportunities for sensory play. 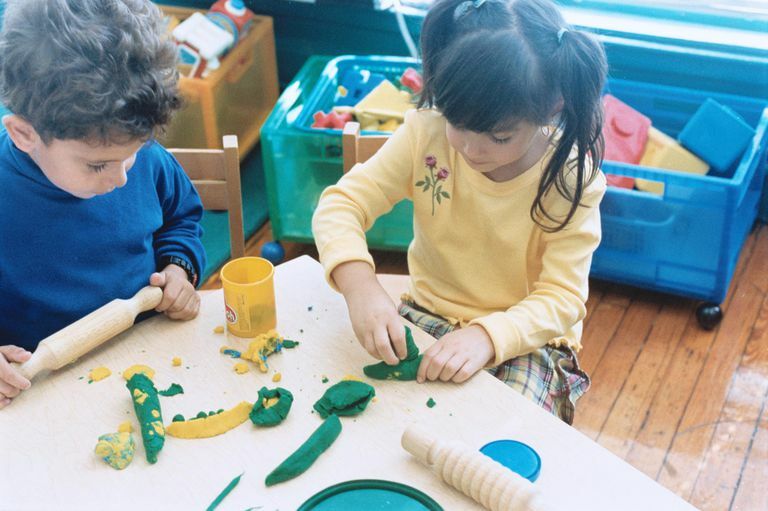 Playing with different types of textures, tastes, and objects help your child build new ways of talking about the world. Suddenly, the tree is more than a tree, it's a sapling with smooth bark, or it's a pine tree with rough bark and a sharp pine scent. Water isn't just wet, it can be rough (waves), slippery with bubbles, or cold and translucent when frozen. Tastes, too, can build your child's language base. No longer does she want hot dogs for dinner, but she wants something tangy or salty or sweet, but certainly not bland or bitter. There are two main types of motor skills your child develops; fine motor skills and gross motor skills. Gross motor skills deal with the coordination of large muscle groups and are responsible for activities like running, walking, etc. Fine motor skills are those that require the ability to use and coordinate small muscle groups and are important for writing, shoe-tying, buttoning, and zipping, among other things. Sensory play often involves using and building fine motor skills by exploring things using pinching, pouring, and lacing movements. You may have noticed that your child is calmer after bath time or that, after a particularly rough session of jumping around the room, banging into furniture, crashing onto his bed or into pillows, your child seems more grounded. This type of sensory play is calming for kids, as it helps them regulate their internal discomfort, whether that discomfort was boredom, restlessness, or some other type of agitation. Should I Let My Kids Win or Play to Win?